It’s feels awkward watching someone else work for your entertainment. 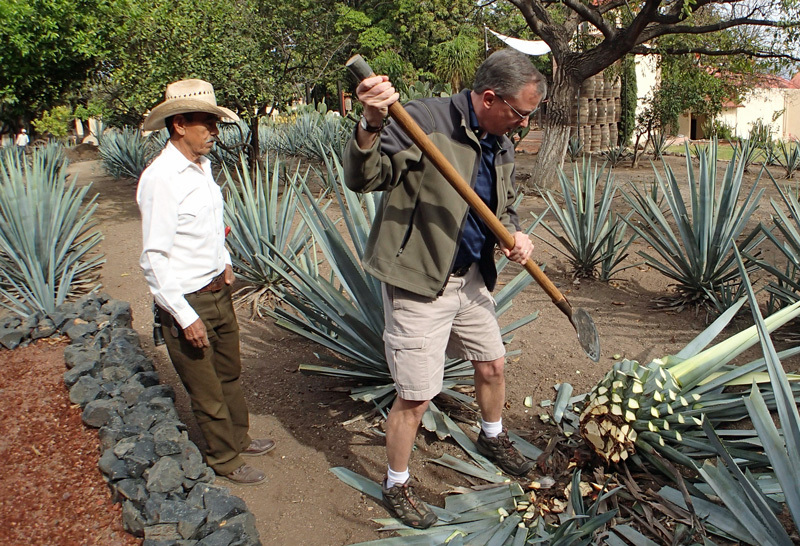 But on this cool, dry morning at Casa Noble Tequila distillery in the hills outside Tequila, Mexico, that’s what we’re doing: admiring a veteran agave harvester, known as a jimador, demonstrating his centuries-old trade. With hundreds agave plants stretching out in neat rows before us, their yard-long, knife sharp, prickly edged leaves threatening our approach, the jimador, Quirino, selects one for today’s death sentence/entertainment. The tool of his trade is a coa, a semicircular steel blade attached to the end of a wooden handle. With a single swift thrust, he severs the agave from its shallow roots in the dry soil, and begins cleaving way its leaves with smooth and deliberate accuracy. “That’s just damned impressive,” a colleague admires out loud, and our sextet of reporters agrees. His work reduces the plant to its core, called the piña, an egg-shaped mass weighing about 20 pounds. The process, clearly slowed down for demonstration purposes and pictures, takes about 2 minutes. On a normal work day, he’ll do this at least 200 times. Somewhat disturbingly, the yellow-green sculpted piña, now lying in the dirt row, resembles a bloodless severed head. Quirino extends the coa to me, offering me a chance to dismantle another agave. I’m surprised by its weight: surely 10 to 12 pounds. The wooden handle, perhaps 4 feet long, is thick and smooth and requires a firm grip. Doubtless a misplaced blow would damage my foot. About a dozen cuts with the coa is all it takes to open a blister on the knuckle of my thumb, a blemish earned two days before while raking leaves at my home. Seeing my wimpy hand bleed cues Quirino to show us a small cow’s horn attached to his belt; it is packed with solid lard for moisturizing his hands regularly during the punishing work. As sweat beads on my forehead, it occurs to me that his slight build and long sleeve shirt hide all indications of the muscular power required to perform such work for perhaps 50 of his 76 years. Others then get their turn at dismantling another hapless agave, which spent the last eight years growing in Tequila’s arid climate only for the purpose this humbling demise at the hands of amateurs. 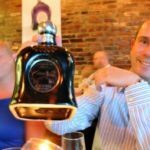 Its destination is the horno, a large, stone-walled oven where it will be roasted 36 hours to remove most of its water to yield a soft, agave syrup-rich mass. That bulk then travels to a custom-made pulverizer using rotating blunt knives to reduce the pinas to pulp. That pulp is then allowed to ferment in open tanks, yeast is added to produce alcohol and the whole mess is then distilled three times. The result is tequila, some of the world’s best, and we’re off to the tasting room for an extended sampling.